Hey, BlizzCon people! Kotaku is partnering with Samsung to hold a party at Heat Ultra Lounge in Anaheim, CA tonight where you can test drive the 950 Series 3D LED Monitor. There's an open bar, free food, and you could be one of 3 lucky attendees to actually win a Samsung 950 Series 3D LED Monitor. 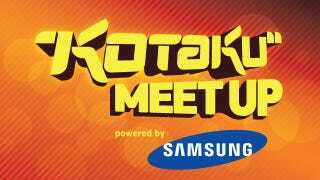 RSVP to meetup@kotaku.com to get on the guest list (be sure to include your Twitter handle) and play Blizzard's specially-released Diablo III beta on the brand-new Samsung 950 Series 3D LED Monitors with Kotaku editors and fellow readers. The party starts at 8pm and goes until 10pm**. See you tonight! Standard contest rules apply. You must be present at the Kotaku/Samsung party tonight and your tweet using hashtag #Samsung950Series must be one of the top three most retweeted to win. *A representative of Gawker Media will select the winners from eligible tweets at his or her sole discretion at 10pm PDT on October 21, 2011. **Not until 11pm, as previously stated.